Four poster beds, elegant livingrooms, and double-vanity marble bathrooms are just some of the luxurious found in our 24 Executive Suites, 9 Regency Suites, 4 Special Suites and 2 Presidential Suites. The d�cor is pure Bali with ornate wood carvings, intricate ikat patterns, traditional stonework and allegorical paintings. All come together to create that right touch of romance. 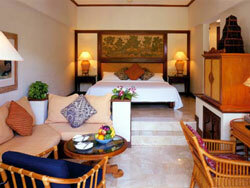 Our two Deluxe Villas are in a class by themselves. Regency Club offers its own rewards. There is a private swimming pool, as well as a concierge and Butler to look after you. At the Regency Club Lounge you can enjoy complimentary breakfast, all-day coffee and tea, and evening cocktails and canape's.